So, I know last year I said I wasn’t doing resolutions – I was just doing goals (ultimately the same thing, right?) More and more people do that, I think – shrug off resolutions as an overrated thing that are made and broken year and year (true enough!). Therefore, in an attempt to fit in, I occasionally refuse to do resolutions. But secretly? I love them. And you know what I love about them? Nothing too unique. Just that it’s a legit excuse for a new start. Again. While the middle of the year, it may feel silly and perhaps useless (at least for me) to be like, Okay, I messed up the last three months, I’m going to start again, no one few people ever laugh at you for doing that on the new year. It is a time of fresh starts and perspectives. My goals are the same as last year – losing weight, writing more, being a better Christian – but every year I get back that motivation that I seemed to have misplaced throughout the year and I think – Okay, maybe this time. Not saying I shouldn’t try harder during the year – but I am goal and list oriented, and New Years feels like my ISTJ/Type 1’s time to shine. I should probably just embrace the fact I love that, and move forward with the same resolutions year after year without being embarrassed to admit it. I make no false promises to myself or God this year – I know that more than likely I will fail again to fulfill all my goals – but that isn’t going to stop me from making them and from trying – again and again. And one thing I am especially going to try to commit to – is to try not to be afraid to be myself. Not to adjust my opinion to fit in with other people – but to realize that it is okay to have my own view of things. Many people don’t think I struggle with that – but every single time I hear someone express something, I instantly start to rationalize why they are right in my head, assuming I am wrong or should adjust my thinking. It is a constant struggle that I hope to someday get the better of. So here’s to a new year, resolutions, lists, schedules, perfectionism, not being afraid, and trying again and again. 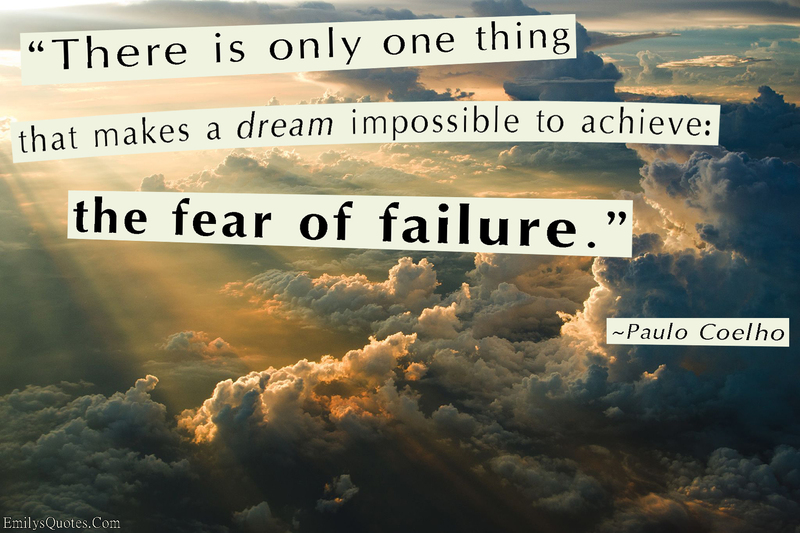 First things first – head over to my other blog (http://storyidyls.blogspot.com/) and check out my most recent post on fear of failure! Because you all know that is my favorite subject, so I couldn’t resist posting about it on there too and am currently working hard not to regret it. Second things second: I love you , my readers. Mostly because I don’t know any of you and you still take the time to read my stuff and I don’t have to feel self-conscious because I know if you like it, it is because you actually like it because you aren’t going to have to face me at any point and pretend to anyway. Which means I can be myself around you. There are things which it is our duty to cover in silence. We are told nowadays that everything ought to be expressed if we are truly “honest” and “open.” Proverbs 11:13 says, “He who goes abroad as a talebearer reveals secrets, but he who is trustworthy in spirit keeps a thing hidden.” Jesus sometimes refused to reveal the truth about Himself, even when it would have seemed to us an opportunity to witness. He did not always answer questions. He did not always say who He was. He told some of those He healed to tell no one about it. “For every activity under heaven its time . . . a time for silence and a time for speech” (Eccl 3:1, 7), “A man of understanding remains silent” (Prv 11:12). Lord, deliver me from the urge to open my mouth when I should shut it. Give me the wisdom to keep silence when silence is wise. Remind me that not everything needs to be said, and that there are very few things that need to be said by me. I haven’t written in awhile I know – I have been surprisingly busy – or too tired. One or the other. I took a work trip to Phoenix, which was just lovely. The only down side, of course, was that my husband wasn’t with me. Around that time, my progress in CampNaNo began collapsing and I barely have written a word since. Until today. Today I have my computer up at work and am interspersing 5 minute writing bouts with real work (and this blog entry – shh, don’t tell my bosses! :P) But really, I work better when I get some of my creative juices out – otherwise I tend toward random daydreaming bouts. To tell the truth, I’ve also just been too depressed to write. Both bookwise and blogwise. The current politics and morals (or lack thereof) swirling about the nation and facebook have been weighing me down like . . . like a sandbag filled with water. I can hardly believe how quickly the nation has gone from respecting the freedoms of others, from family values, from a good moral stance, to utter chaos. From homosexuality to women posting naked pictures of themselves to make some type of political point to all the attacks our president refuses to do anything about to the violent protests outside of presidential rallies to the undeniable escalating racial tensions. In addition to all of the chaos in the nation, I notice more and more the deteriorating moral state of friends I used to have from college. I see people I never would have thought of as liberal posting in favor of moral standards that are strictly against Biblical principals. Or posting inappropriate pictures. Or straying further and further from God in various ways and seemingly thinking nothing of it. It is – just depressing. I’ve been having a very hard time over it and finally yesterday I cried out to God for peace – I just didn’t know how much longer I could handle it. My heart was so heavy. I’m not saying I got instant peace – but – God did speak to me. He reminded me that He, too, looks down and sees everything going on and that, if it makes me sad, it makes Him sad tenfold. That if I feel like shedding tears over sudden lack of any morals or standards in our communities, then He has filled an ocean with his sorrow. And He reminded me that my job is to continue to be a light to those around me. Not to take the burdens on myself, but to acknowledge they are there – to pray about them – to hand them to Him, and to continue to stand up for what I know is right, no matter what those around me do. That if someday I am persecuted for standing up for my religious beliefs in this country that supposedly allows religious differences, that He will still see me and support me. That it is no worse than many of His disciples went through for standing up for what was right in a world that was wrong. So, although I am still immensely saddened by all that I see on social media, in the news, and even walking down the street, I am seeking to consistently pull God’s peace over me, to pass it to Him in prayer, and to be a light in the darkness, living in the moment that God has given me instead of fear for the future. I know that my posts on my blog are off and on. Usually how much I post or don’t post is a reflection of busyness, yes, but also of guilt and fear. If I am feeling guilty that I haven’t written in a story in awhile, whether a short story, book, or even pursued writing in some fashion, then I tend to stay away from my blog, just as I stay away from writing more and more. Fear begins to overtake me that once I start writing again it won’t be anything worth reading. And then guilt assails me for not doing what I love – for being too fearful to do so. And it is a dreadful circle that goes round and round. Would you like to know what makes it ten times worse? I went to a college with a bunch of smart people – people so smart, that I looked dumb next to them despite my all ‘A’s in my previous college and high school. On top of that, I went to college with a bunch of people who, like me, love to read and write. LOVE it. And now, suddenly, a multitude of them are posting on Facebook talking about the books that they just finished writing. One is publishing it himself, one is publishing chapters online, one has an agent, one just finished and is looking for an agent, and I see all these posts and I feel anger. I feel defensive. My heart swells up and my mind cries out “NO! That isn’t fair! You can’t be bragging about finishing a book – you don’t have that right! I have wanted to be an author since I was 7 – so don’t tell me you have the right to be claiming to be a writer before I have finished a book! !” And I turn away and pout and stay away from my own book, beset by my fear and guilt, making no more progress than before, and instead coming home from a long day at work, making dinner, and then sitting in front of the TV, too scared to actually pursue my dreams – because what if they fail? But if I am being honest with myself, and I have been recently, as I look at those posts and cry out “That’s not fair! You don’t have that right!” I realize, yes, it is fair, and yes, whether they have wanted to write for 20 years like me, or only 1 year, they have that right because, UNLIKE me, they got up off the couch, turned off the TV, and wrote their book. I am tired of being ruled by fear. I am tired of not pursuing my dreams. I am tired of being too afraid to call myself a writer.